My Dearest Reader’s as you know my family lives in Hong Kong and I go back regularly, and every time I go back I will get Hong Kong style egg waffles. It’s actually getting harder to find them in Hong Kong as they’re not being sold on the street anymore. 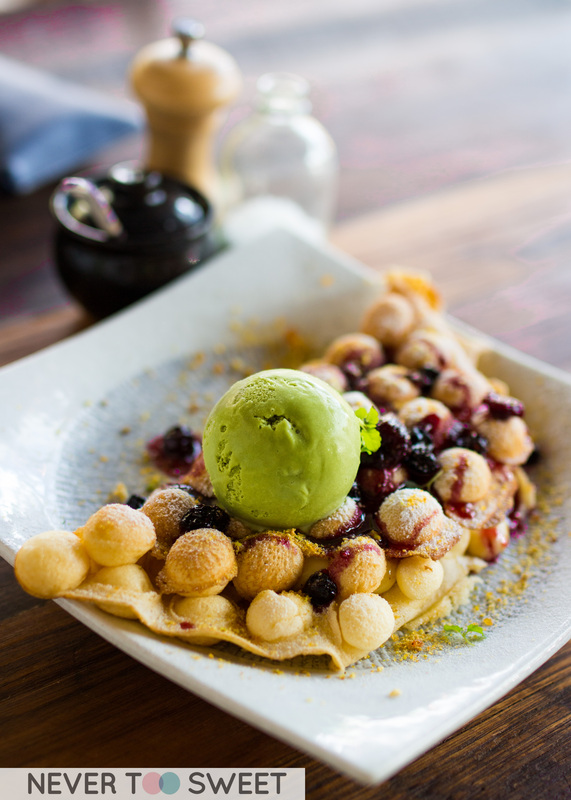 So I was quite excited when Michelle (The Bakeanista) told me a new Asian inspired cafe Baba Sus was serving these egg waffles. Baba Sus is one of those hidden cafes that you would not have found if unless you were specifically looking for them. However, it is actually very close to Burwood Train station and is adjacent to an apartment complex. The cafe has great ambience with cute retro chairs and wooden tables. 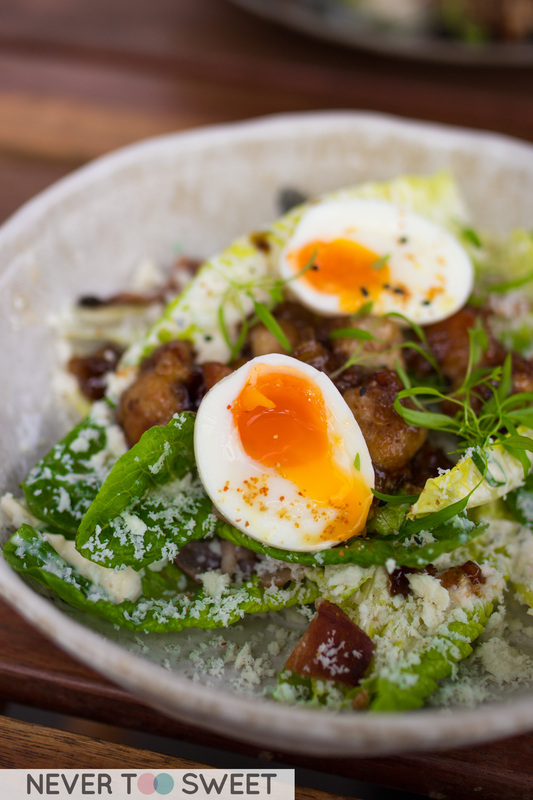 We ordered two dishes to share, the first was this Japanese Chicken Caesar with sweet soy chicken (teriyaki) cos lettuce, pancetta crisp, salted ricotta, soft boil egg and gribiche sauce. I am a sucker for yolk pork shots haha so this definitely got me squealing. Although this is a really simple dish, it was the perfect light refreshing lunch dish. 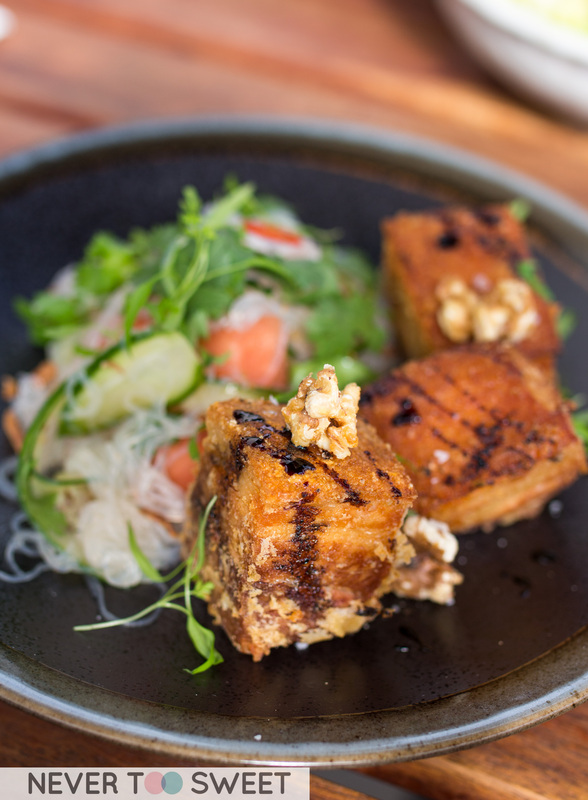 We then ordered a richer dish the “Pork Luck” twice cooked pork belly, apple balsamic, vermicelli and watermelon salon topped with candied walnuts. Another great dish, the pork was very crispy on the outside, it still remained tender inside and not too stringy. I was a little skeptical about the watermelon salad at first, but it complimented the pork very well with the sweetness. 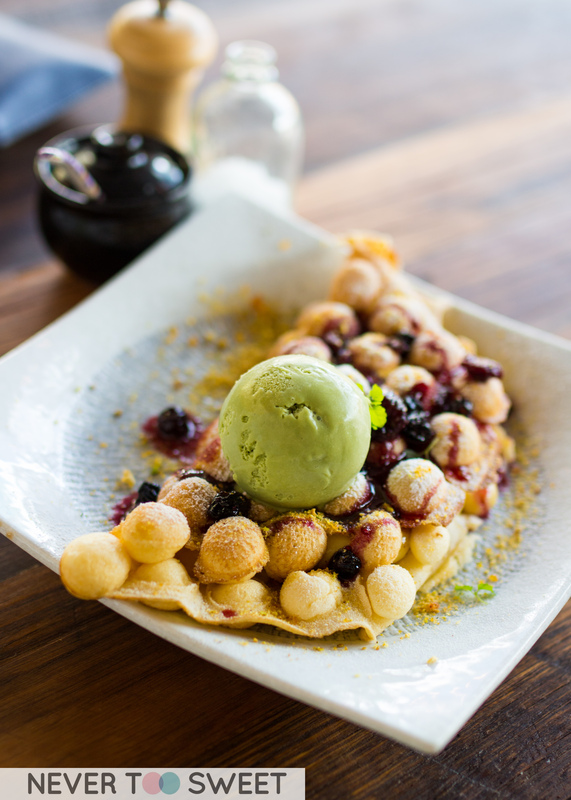 Now let’s have a look at the Hong Kong egg waffles with Vanilla custard, green tea ice-cream, berry compote and pistachio praline. Another very pretty dish with all the different colours, I also found the egg waffle to be bigger than the ones we have in Hong Kong. The texture of the waffle was softer and more dense, I really enjoyed the addition of the vanilla custard inside. But I found the green tea ice-cream to be a little bland, and perhaps would have been a better match with vanilla or salted caramel ice cream. To end this great brunch I got a Magic (double ristretto) once again latte art was perfect and the house blend had wonderful floral notes. I had such a great time catching up with Kennise and thoroughly enjoyed all the dishes at Baba Sus. Now I just need to find time to drag Mr Bao back again with me! Allow me to share another photo of the Egg Waffle because it’s so beautiful! I first noticed Easey’s on Easey Street in Collingwood a few weeks ago when I attend an event nearby. I looked up and noticed 3 trains on a rooftop of a 5 storey building, I could see a couple of people inside and some lights. I thought it was one of those party venues, hired out for private functions such as a 21st birthday. But it turns out to be Easey’s which servers burgers, fries and drinks. Pretty cool if you ask me 🙂 It was quite dark so unfortunately, I didn’t get a photo, but next time I go I promise to take a photo and update for you guys to have a look! The decor is very hip with graffiti all over the walls, and I was quite impressed that they had lifts that went from the ground floor all the way up to the train carriages, even though each floor was quite small. I highly recommend making a booking online or calling them, as it was absolutely full when we arrived at 6:35 for our 7pm booking and still had to wait for the table to clear. I really liked how the menu was designed, like information for Train lines, the names were quirky and the most interesting was the prices appeared in the form of when the train was going to leave for instance, the “Easey Cheesy” was “8:00” which mean it was $8. We waited for a good half hour before we got our table, but staff we’re very friendly and offered us another table downstairs where we could wait and grab a drink. We were really hoping to be seated in one of the three carriages, however, they were all full so we headed down to level two one of their dining rooms. I really liked how the tables also had map of train lines in Melbourne. The soft drinks are $4 with unlimited refills or you can add a meal with chips and soft drink when you order a burger. I was surprised Garfield only wanted the “Easey Cheesey” because it seemed a little small and I wasn’t sure if he was going to be full. But he was determined that it was enough, it is the more traditional burger with beef patty, American cheddar, lettuce, tomato, pickles, onions, ketchup, mustard and mayo. You can also swap it for a potato cake if you want a vegetarian 🙂 I stole a bite and really enjoyed the pattie but found the bun to be a little cold. Dyring was starving so he decided to go for the “Too Ease” with 3 extra patties!!! Haha so it became a 5 patty burger. The waitress was so calm when he placed the order, and she told me it is because this nothing compared to some of the 10 pattie with dim sim burgers she has put through! Kudos to Dyring for being able to put the burger into his mouth without anything falling out haha he actually finished it within 5 minutes! I was totally impressed. He seemed to really enjoy his burger and said next time he can totally do 10 patties with ease so please wait for blog post part 2 when he does the challenge. I think with 5 patties haha we had enough beef so I decided to go for the Changaz Sanga which is a chicken burger with Easey’s fried chicken, bacon, American Cheddar, lettuce and mayo. It may not seem like a very big burger, but I honestly had trouble finishing it all! I think all the flavours in the burger was great just found the fried chicken to be a little bland. These look like regular chips but trust me these were one of the highlights of the night especially with that chipotle mayo!!! Garfield couldn’t stop eating them, I was so close to ordering another serve! I’ve heard of pop tarts and I’m sure I’ve had it before, but I have never had deep fried chocolate ones and I dare say it has CHANGED my life!!! I wasn’t expecting it to be this good before trying 🙂 The crunchy texture on the outside reminded me of a donut but the pop tart centre was soft and oozy like a fondant! We all had a great time at Easey’s and think it’s a great space and has a lovely casual vibe to it. Perfect for a night out with mates, it is also very reasonably priced. Service was a little slow that night, that I can understand as they have only been open a couple of weeks and were already packed, so book online before you go 🙂 And don’t forget to try the deep fried pop tarts!!! I’m such a stalker, I am always stalking my foodie friends on Instagram to see what new cafe/restaurant they have recently visited and Rustica Sourdough is one that has been coming up on my feed quite frequently. But my ever growing ‘to-go’ list, it simply slipped my mind. Hence, that’s why I jumped up in joy when I received the email from ID Collective to visit Rustica Sourdough cafe. We were very lucky and found parking just around the corner, and that’s where we realised Rustica Sourdough is actually opposite from Hammer and Tong another popular cafe 🙂 The cafe staff were all very friendly and welcoming, immediately showing us to the table they reserved for us. Mr Bao has been working quite hard so dragging him out on a Saturday morning (it was closer to midday 11am!) isn’t easy. So a lot of bribing and coffee is required to wake him up. 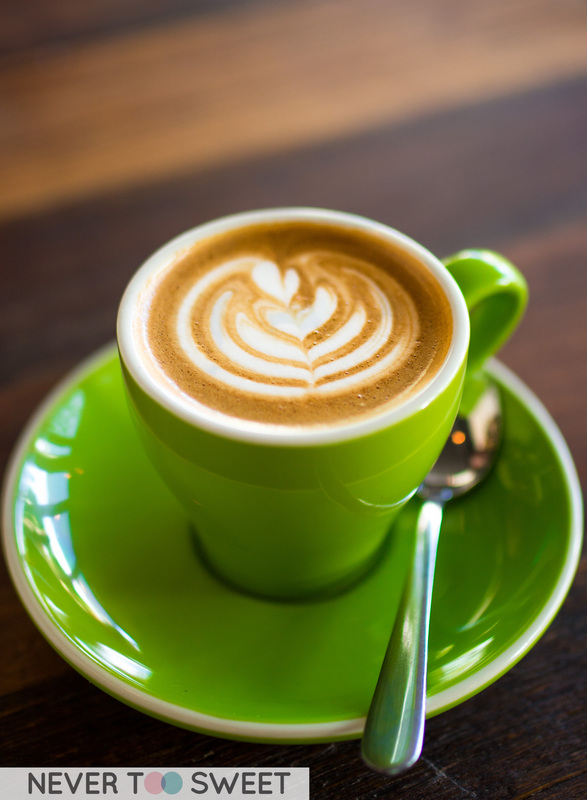 He’s recently changed his preference and opted for a flat white, he found the coffee to be very floral in taste and with a softer body. I would never pass the chance to have a hot chocolate, but when it’s using Monsieur Truffe chocolate I will definitely order it! 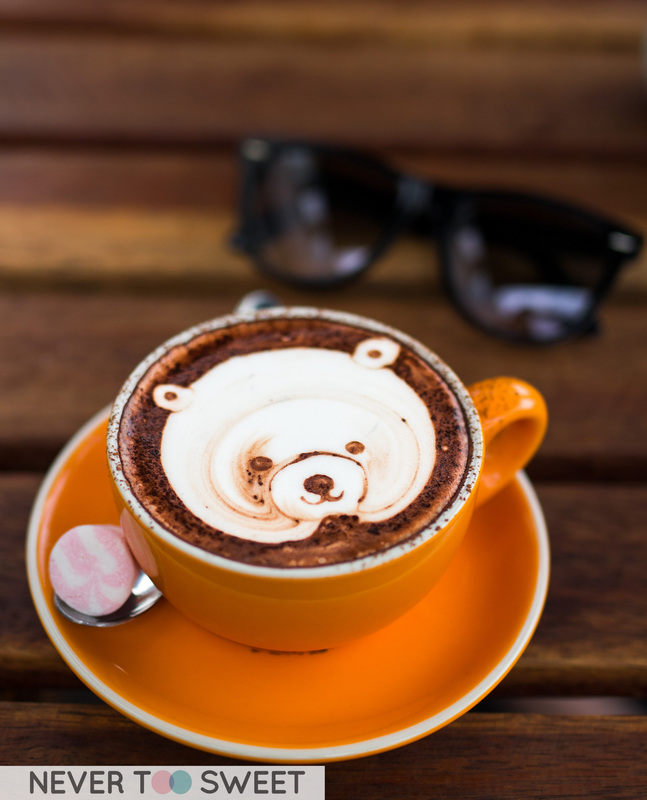 For those who don’t know Monsieur Truffe is a boutique chocolate maker in Melbourne, and seriously their hot chocolates are one that should not be missed! This one did not disappoint and I found the native flowers in the background to be so pretty too. I already had my eyes and heart set on the french toast, so I tried to choose a healthier dish as my brunch and it was this sweet basil sourdough topped with Grandmother ham, heirloom tomatoes, crush avocado and Merideth feta. As the name of their cafe/bakery suggests their sourdough is absolutely scrumptious, lightly tense with a slight tangy aftertaste. I particularly enjoyed the moist and flavoursome Grandmothers ham which wasn’t too salty. I know I am being greedy but I would’ve perhaps like an egg or two on top of my sourdough, only because I am an egg yolk addict! Mr Bao wanted something substantial so nothing beats a beef brisket burger with pickles, herb slaw and French fries with Chipotle mayo. The beef brisket was very tender and flavoursome, only needed some more Chipotle mayo inside. Great lunch dish and highly recommend if you like brisket! We had a short break before we moved onto dessert and that is the French Toast using brioche topped with fresh peanut butter, Nutella, strawberry jam, ice-cream, chopped hazelnuts and chocolate cookie crumbs. Now please tell me that sounds AMAZING! We had such a lovely time at Rustica Sourdough, blown away by the service, food and more importantly the bread and pastries. Look look! I already need to plan a revisit and not eat anything but the croissant, cronut, and fig + peanut butter tart! As we were heading out one of the friendliest staff stopped us and said they had a little goodie bag for us to take home. We were completely not expecting anything and it was definitely not a little bag, there were so many things in the bag – sourdough, pastries and doughnuts! All that flakey pastry just staring at me and telling me to ‘Eat it, Eat it’! But I was unfortunately too full, so took a couple of quick snaps and saved it for later. The chocolate croissant was super flakey with thick chocolate and crushed nuts nom nom perfect with a cup of coffee. The lemon curd doughnut was tangy and a slightly dense texture and the strawberry jam was also delectable. Last but not least was this profiterole with I’m pretty sure cream cheese, raspberry ganache and freeze dried raspberry. Phew, that was a lot of food to get through in this post haha but the pleasure was all mine! Anyhow, I have been wanting to blog about this new restaurant for the longest time since the first time I visited for breakfast. But I knew I had to wait until I tried their famous steak and fries before I did! So you see Entrecôte has recently opened up on Domain St, South Yarra. If you remember, I posted about the Le Relais de L’Entrecote in Paris a few years ago. 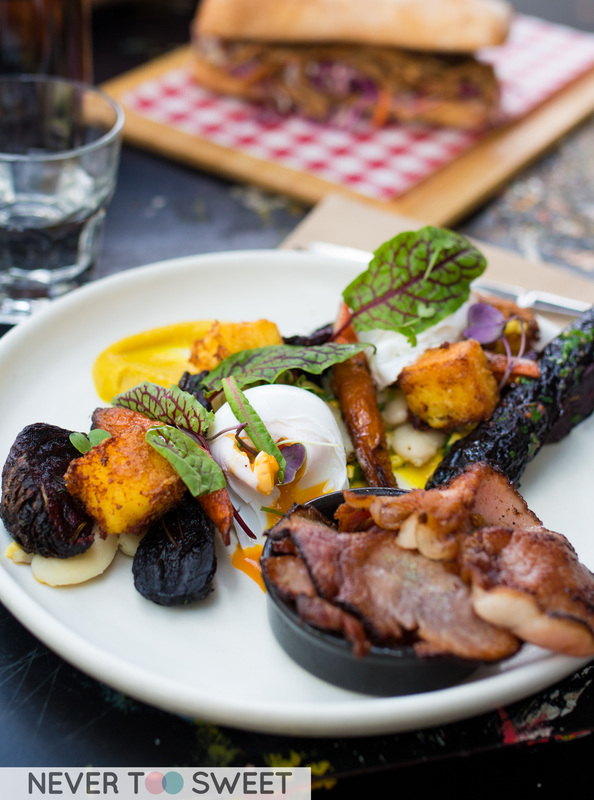 Well Melbourne now has their own version, with a little more variety on their menu they serve breakfast until noon, and then offers steak and fries along with a few more items for lunch and dinner. Bro had a quick look at the menu and decided to get the Croque-Monsieur with hand carved Bill’s ham, three cheeses and thyme béchamel. I most definitely tried a little and thought it was lovely and actually not as rich as I thought it would be. Q had trouble choosing what she wanted so I suggested the Le Petit Dejeuner which is the Parisian continental breakfast. For $19.9 it included many items such as orange juice, tea, coffee or hot chocolate, croissant and baguette with Bonne Maman jams, 63c egg, brioche and bacon ‘crumbs’. I think the 62c egg with the bacon crumbs looked wonderful and I can’t wait to come back and try myself. Just the feeling of sitting outside on the patio with a croissant just makes it feel like you have been deported to Paris. Brunch wouldn’t be complete without dessert so I forced Bro to share the French toast with lemon curd ice-cream, lemon verbena poached etches and buttered almonds. This dessert reminded me of bread and butter pudding as it was very soft, it wasn’t very sweet and I thought the poached peaches were actually quite tart. A couple weeks later, after rescheduling 3 times, I finally managed to drag Mr Bao out for a date night back at Entrecôte. I wanted to get there between 4-6pm as this is when they had their happy hour, with $2 oysters and $7 champagnes. We started our early dinner with a house red for Mr Bao which was a dry shiraz and complimented the steak to come very well. We started off with a dozen of shucked to order with ‘Mignonette’ sauce and lemon, I’m not quite sure where the oysters are from, but they were quite salty and was great with a few drops of lemon juice. Mr Bao was so happy, he ordered another dozen and immediately devoured them. Ash (Im So Hungree) recommended the French Onion Gougere which is essentially a profiterole with French onion and cheese filling. The choux pastry was made very well and the filling was so wonderfully cheesy and paired perfectly with a dry red. The reason why I come back to Entrecôte and visit again before I could do a blog post is because I simply HAD to try the Steak Frites with soft leaves and see how it compares with Paris. The steak is from Hopkins River and we ordered it to be medium rare, just looking at the dish it looks very similar to Le Relais de L’Entrecote. I found the béarnaise sauce to look more limey and didn’t taste as strong. The shoe string fries comes with complimentary refills so forget about calories and eat till your hearts content. It also comes with unlimited soft leaves with radish, walnut and Dijon vinaigrette, admittedly not as exciting as the steak and frites, but the tangy Djion vinaigrette does make it a little more interesting. I wanted to try something different and since we were siting out on the patio we had more options, I ordered the Entrecôte cheese burger with frites. A black angus beef patty with melted cheese and the same Paris bearnaise sauce on the steak. Even though I found the patty to be slightly under seasoned the cheese and sauce definitely made up for it. I honestly wanted to try all the desserts – creme brûlée, apple tart tat in, mille-feuille and profiteroles. But we settled on the Lemon Tart because I had cravings and once again Ash recommended it and I trust her judgement. It was one of the best lemon tarts I have had in a very long time, with a sweet shortcrust pastry and that luscious lemon curd filling that had the right about of tartness and paired with creme fraiche. Personally I think I would have preferred vanilla ice-cream but both are fine by me. No doubt Entrecôte has become a new favourite of Mr Bao and I with its great dishes, friendly staff and most importantly for us dog friendly. I think it’s also a great brunch spot for a brunch of girls to try to be Blair Waldorf from Gossip Girl…ok sorry I got carried away haha I’ve been rewatching the series. Anyhow, we will be revisiting for sure! Have a great weekend! I think I will describe myself as a High Tea Addict! If there’s a high tea I will be there 😛 That explains why I have been a repeat offender and gone back to the Aria Bar at the Langham Hotel in Melbourne so many times. This time Shelle (Iron Chef Shellie) kindly took me to try out the Janice Wong High tea as part of Melbourne Food and Wine festival. For those who don’t know Janice Wong is the executive pastry chef for the renown dessert bar 2am in Singapore which I was lucky to try a couple of years ago when I visited. Let’s jump right into the high tea, Shellie and I are both tea drinkers so we got the usuals. Yes that is English Breakfast for me (can’t be classic tea) and Earl Grey for her. I really liked the china they use too, if I remember correctly it is specially designed for Langham by Wedgewood. We got there quite early on a Tuesday so it didn’t take long for the 3 tier stand to arrive. We started from the top with freshly made sandwiches, and I’m usually quite picky because it’s always a disappointed when they are pre-made and the bread is try. 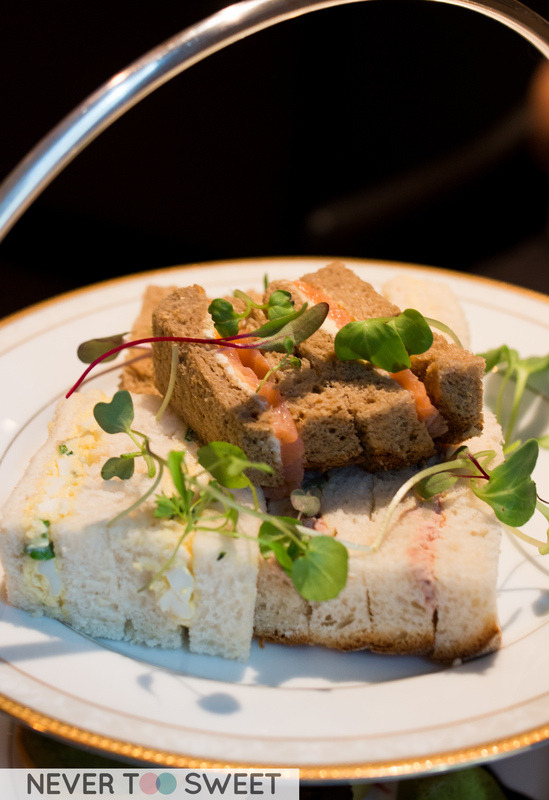 But these sandwiches were perfect, with a good selection of fillings – egg salad, tuna, chicken, cucumber and smoked salmon. 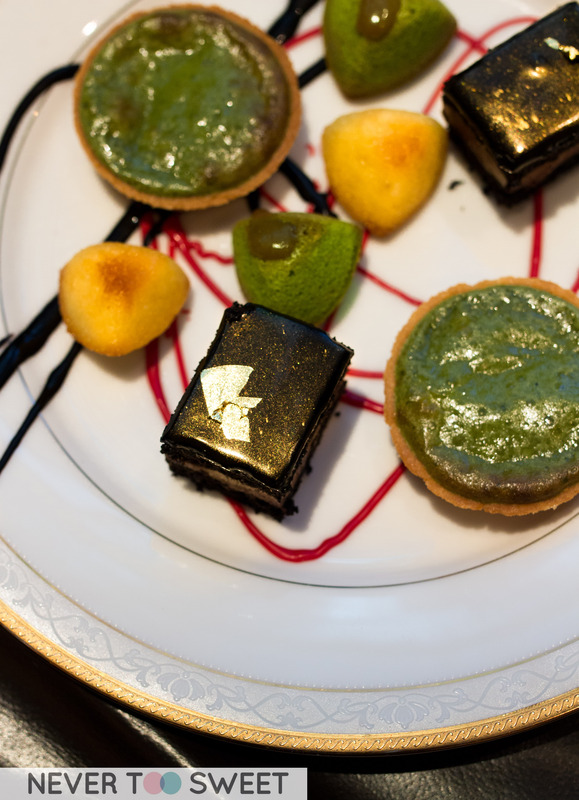 Then moving down were two plates of desserts designed by Janice Wong. And I’m not sure if I can describe to you in words HOW excited I was to see so much GREEN on this plate! 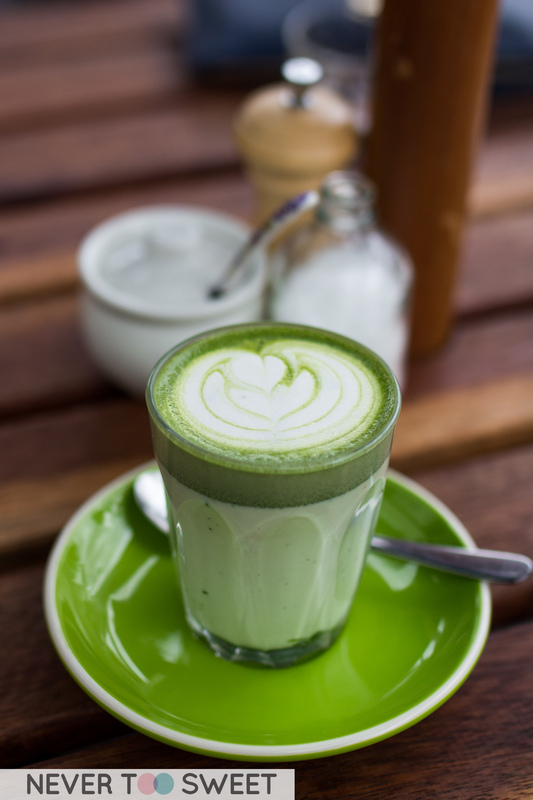 Because the green means MATCHA (Japanese Green Tea) and those who know me will know how obsessed I am about it. 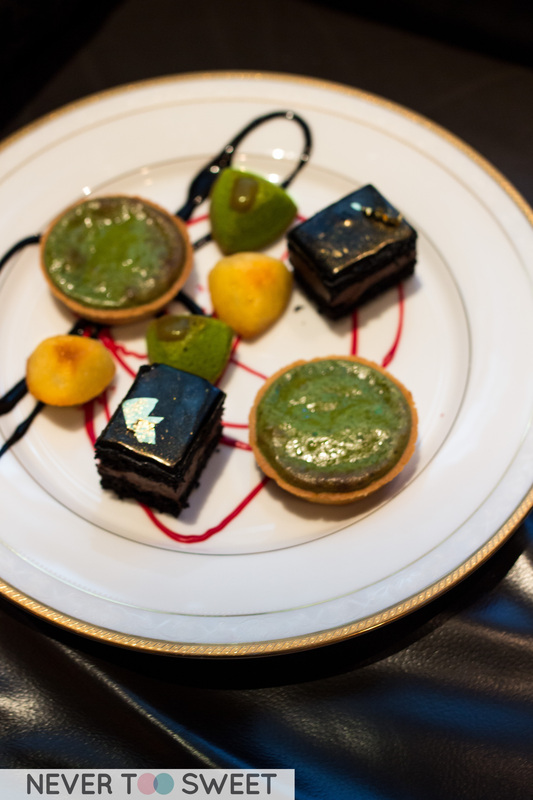 Let me quickly go through, there was a petite chocolate cake very moriesh reminded me a little of the Opera cake, matcha fanciers and also the warm matcha tart. I will repeat that it’s a Warm Matcha tart meaning the centre is not set and I could feel the liquid inside wobble as I picked the tart up. The waiter suggested we started with this first as it’s best eaten when still warm. So here I go! I took one bite and quickly snapped this photo! Were you can see the green liquid gold as I liked to describe it flowing out! 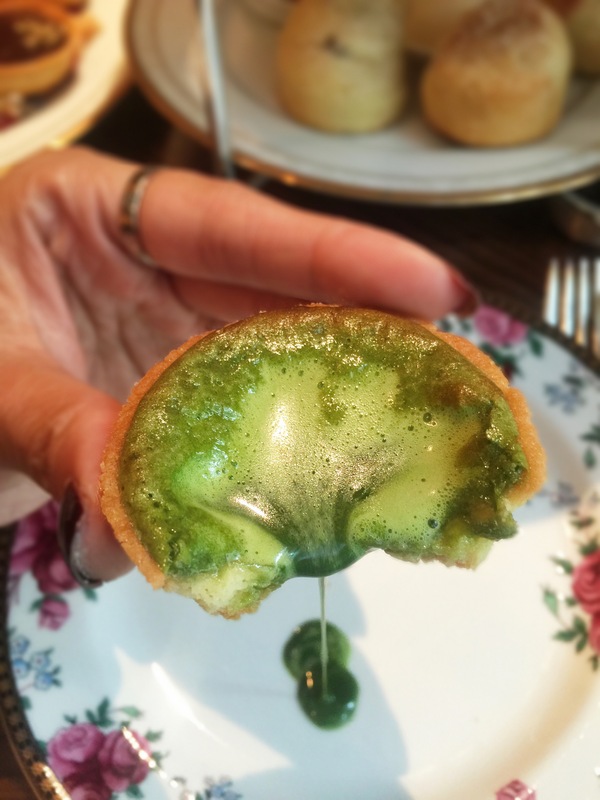 It was have to be one of the best matcha tarts and possibly desserts I have had. The tart case was still warm, with great buttery flavour and crumbly texture. But the filling was simply the best, it had such intense matcha flavour and wasn’t bitter at all! 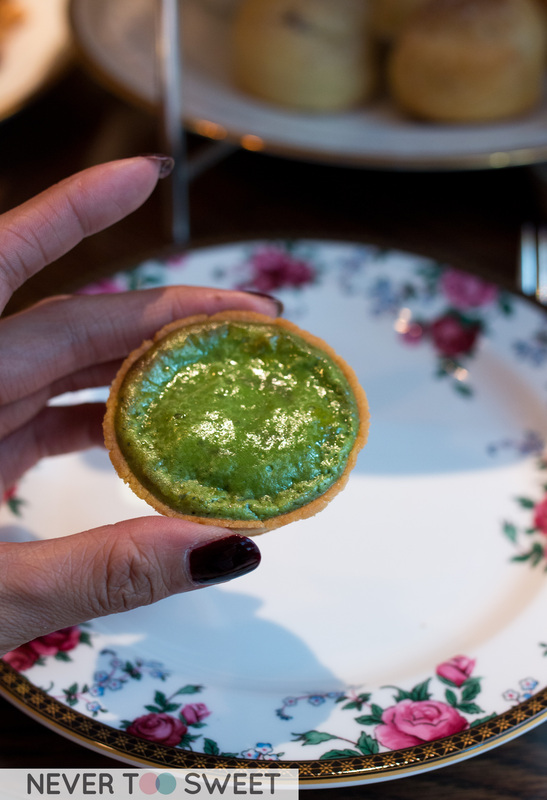 I would go back to this high tea just for this tart again. 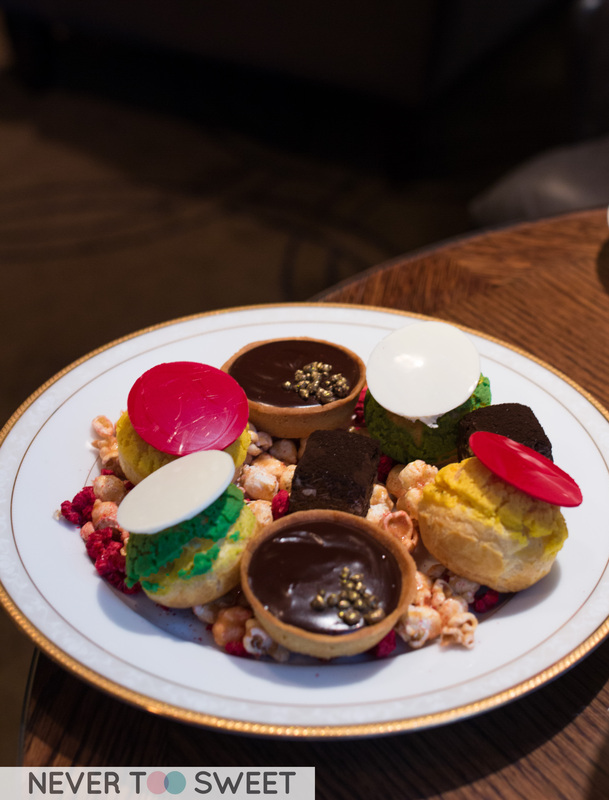 Continuing with the desserts, we moved onto the Singapore inspired choux the green and yellow puffs. The green actually had a kaya custard filling and for anyone who enjoys kaya would have really liked these. 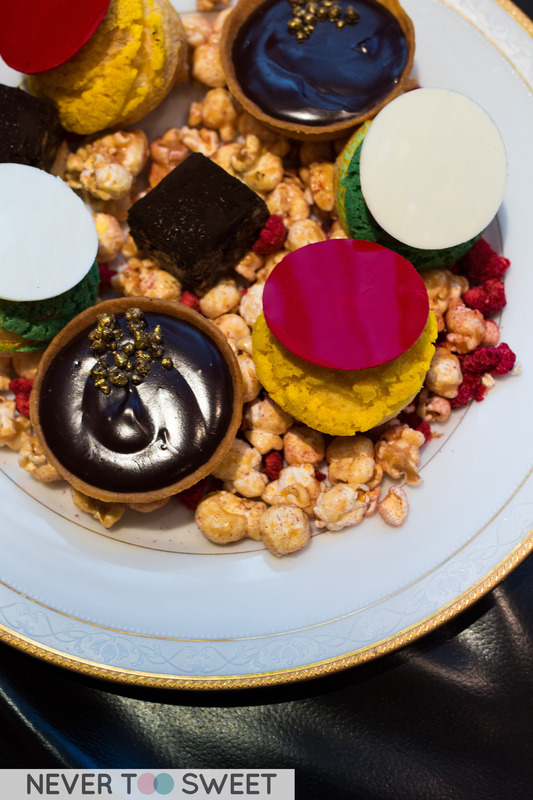 The chocolate tart with golden pop rocks was another impressive tart and even the caramel popcorn with freeze dried raspberries were delicious. I definitely had trouble pacing myself and kept popping them into my mouth. This is a short post, not many photos because I was too busy chatting and catching up with one of my favourite girl Shellie and I really enjoyed everything! Thanks again girl for taking me as my birthday present! 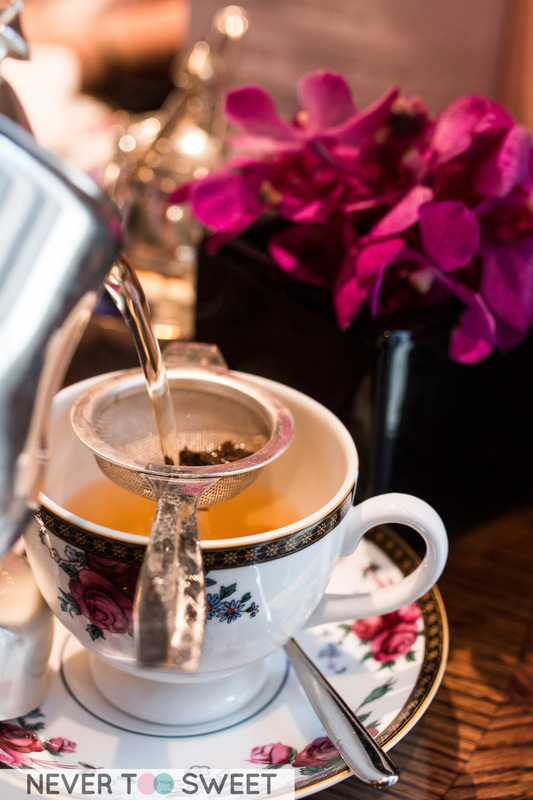 Before I forget the tea set also comes with scones (fruit & plain) butter, clotted cream and jam 🙂 The Janice Wong High Tea is still available for $65 per person until the 13th of March (2 days left) so if you’re quick you might be able to score table. Can you believe it my Dear Readers? It’s already the last day of 2014! I’ve started to reflect back on the things that have happened this year and realised it has been such a turbulent year with so many highs and lows. The highs include getting our little puppy Cupcake, the birth of my niece (name has been confirmed as Valerie) and achieving some new goals at work. 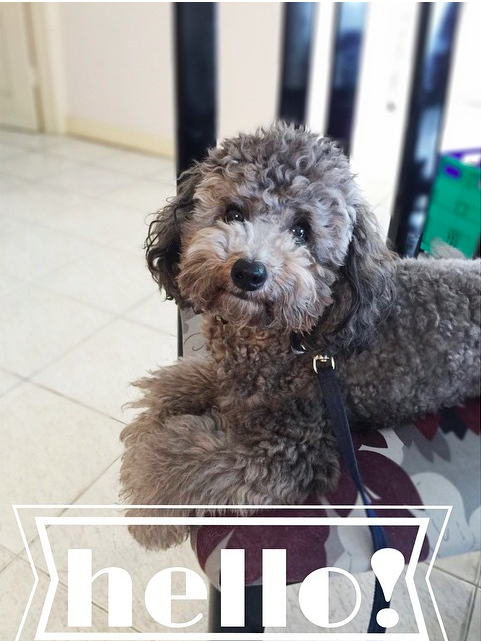 While the lows have been an emergency trip back to Hong Kong for my sister, moving houses and some personal issues. Anyhow, it all doesn’t matter because the year is ending and I am grateful for all the experiences, failures and success! Enough talk moving on to the actual post, brunching has always been a tradition of Mr Bao and I on the weekends and now we bring Cupcake along ~ I’ve seen Addict Food and Coffee come up in my Instagram feed quite a few times and knew I had to come try. 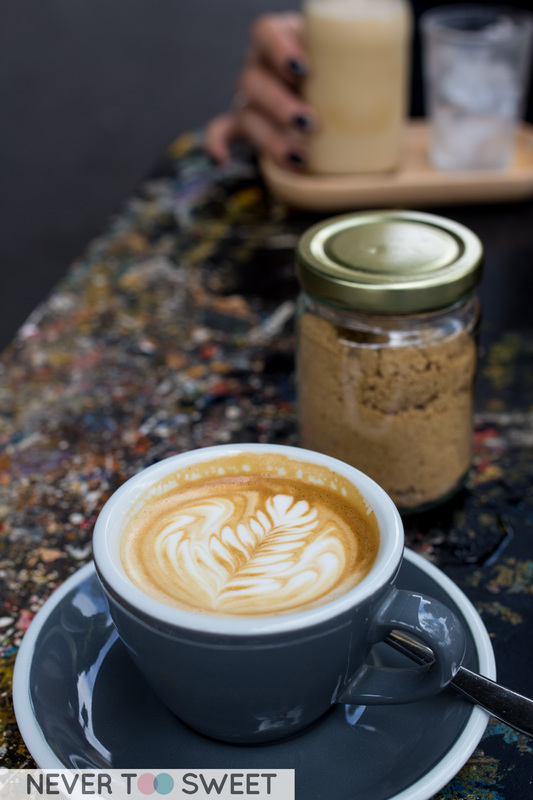 Mark Boyd and Steve Hogan are the masterminds in the kitchen, they previously worked at St Ali and now it was their time to shine 🙂 Mr Bao ordered is usual coffee and really enjoyed his single origin magic and commented on the overall nuttiness flavour. 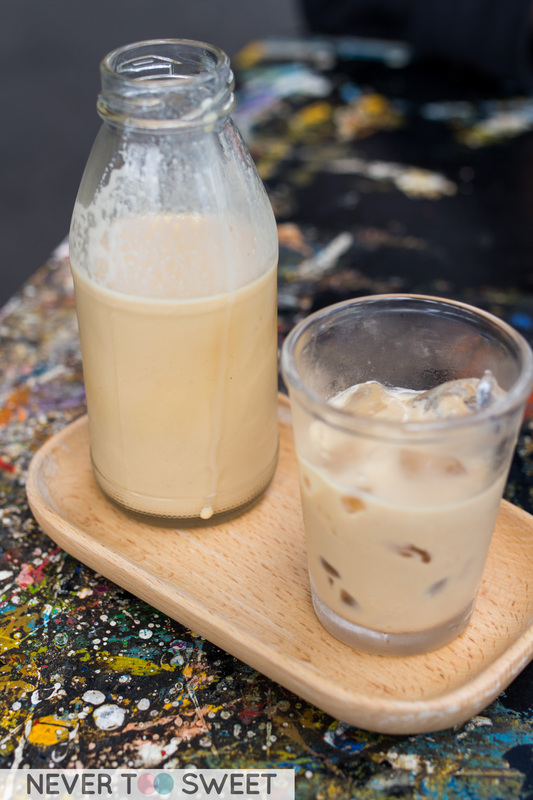 Sorry I forgot to take a photo of the menu, so I don’t have the price for the coffee or food here, but I promise to update it once I’ve revisited and have it ~ It wasn’t a very hot day, but we were sitting outside and the sun was out so I felt like an ice coffee. 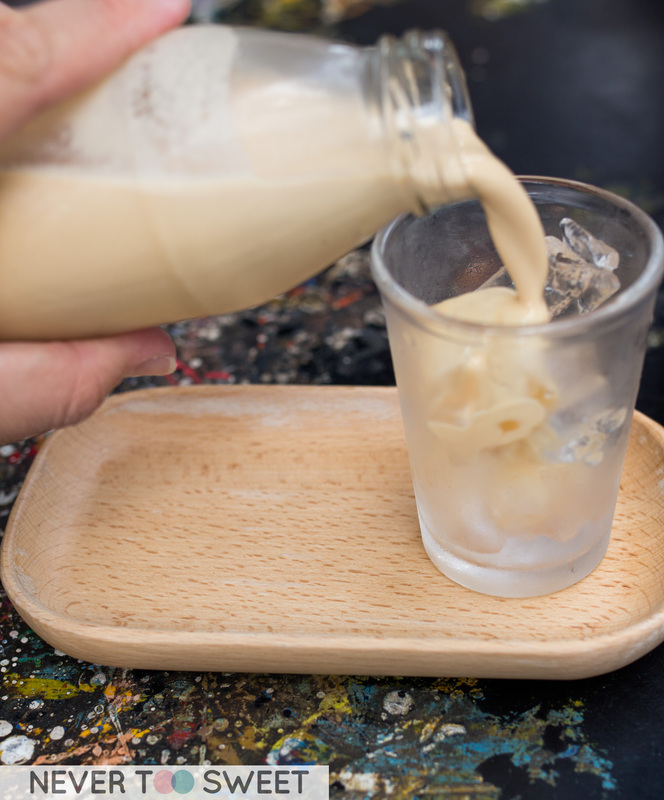 I really liked the presentation of the coffee in a little milk bottle and also a chilled glass with more ice. 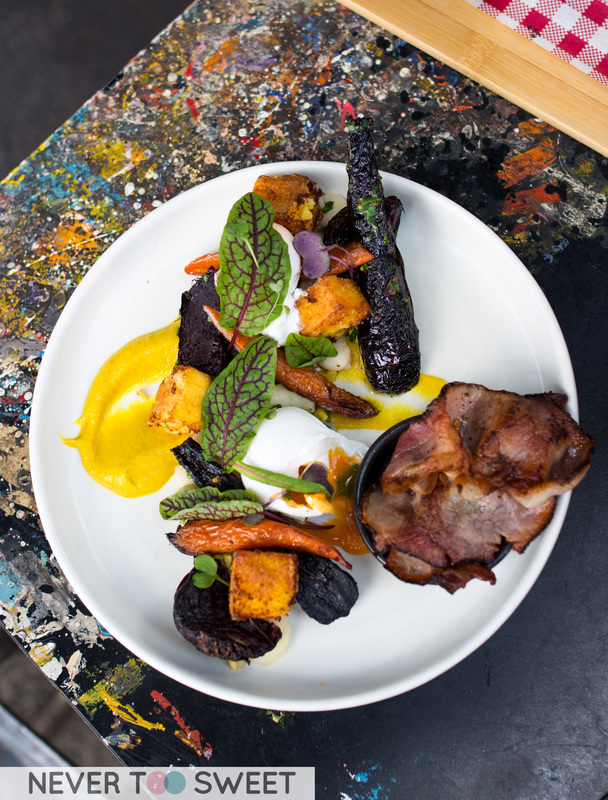 The menu here has a good balance between the traditional breakfast dishes with eggs and bacon, yet also caters for vegetarians and also vegan options. But being Mr Bao… he decided to try the Southern pulled pork burger with Parmesan fries. 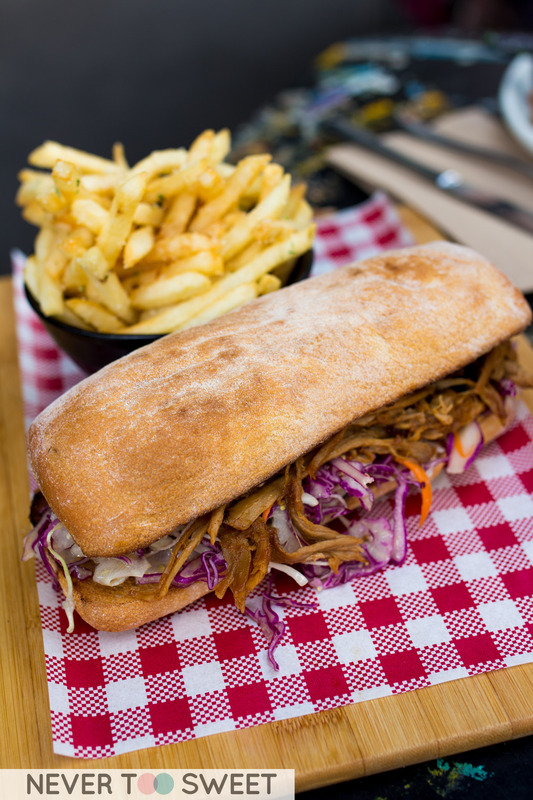 It was more like a sub to me with the long bun instead of the round burger bun ~ The pork was soft and flavoursome, however, what really caught our attention was the Parmesan fries, they were freshly made thin and crispy but not oily. We ended up fighting over who will get the last piece! My choice was this is my vegetarian dish Chargrilled corn with poached eggs, polenta bites, yellow beet puree and also roasted beets. Now you see this was a vegetarian dish but Mr Bao decided to ask for a side of bacon without consulting me, simply because he didn’t want a veggie dish haha not that I really mind but I see no issue with eating healthy somedays! 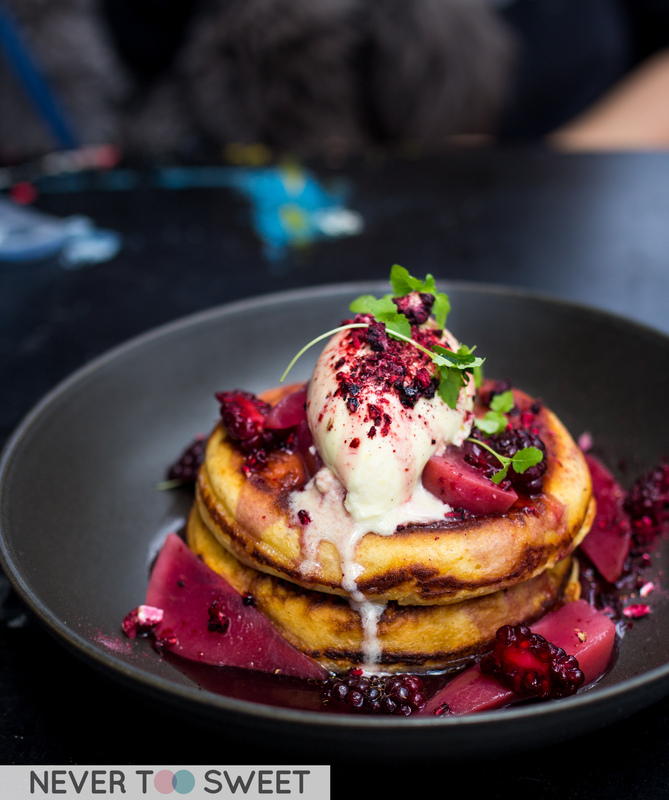 We really enjoyed Addict Food and Coffee, staff were very friendly and efficient and most importantly they have those buttermilk pancakes and very dog friendly which is important to us now. And that ends my last blog post of 2014 on a sugar high! I would like to say how grateful I am for those who have loved and supported me this year. That includes many people but of course Mr Bao (I admit I am hardwork! ), my sister Win Win, my family and friends! But I also also grateful for your support my Dearest Readers, thank you for always being here and supportive loyal even when I haven’t had time to blog, I know you’re still here waiting for me! 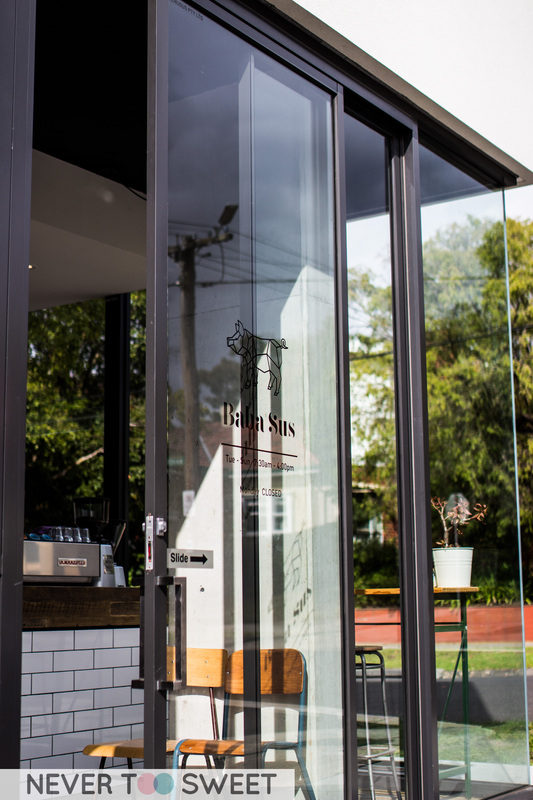 Piggery Cafe, Shannon Bennett’s newest venture up in the Dandenong Ranges. I visited in late September with Sarah (Sarah Cooks), Sandra and Ashley (I’m So Hungree) and have been meaning to write about the event for the longest time. Piggery Cafe is only one part of the Burnham Beeches a historical mansion built in the 1930s and is now divided into different area such as the Burnham Bakery and also an Emu enclosure. There are also plans to open a Burnham Beeches hotel and steakhouse. We chose one of the best afternoons to go, as it was lovely weather not too hot or cold and we managed to grab a nice table outside. Ashley and I took a walk inside the cafe and was immediately mesmerised by the table full of scones, mini tarts, cakes and other sweets! I was in dessert heaven! I honestly couldn’t take my eyes off all the baked goodies! I wanted to try EVERYTHING the scones, lemon tart, mini chocolate cake! I’m practically had to drag myself out back to the table and waited patiently for the waiter to take our order. He explained to us that for $25 per person, includes a selection of savouries, sweet and unlimited flow of coffee, tea or hot chocolate. They use Valrhona chocolate to make their hot chocolate here, so Ashley and I decided to get one each. It had great chocolate flavour, however, wasn’t the thick European type and was rather light and came with a little house-made marshmallow. Next up was a large platter of savoury items, it was a huge shock the amount of food on the board. From the left was a puff pastry filled with mushroom, smoked salmon, seeded sourdough with some addictive garlic spread and also a little quiche. Everything was great and I enjoyed it all but the mushroom pie was definitely a winner with the super flakey and buttery pastry! This was followed by these dainty scones half fruit (dried cranberries) and plain served with jam and whipped cream. I am determined to make my scones smaller at home next time they just look so much more refines and so damn cute when they’re small like this! I slathered a very generous serving of whipped cream and I think it was apricot jam with a light citrus flavour which may have been orange. Scones had a good crust, but was still moist and fluffy inside thumbs up from me! The food doesn’t stop coming, it was then a full plate of Chef’s selection of sweets! A wide range of cakes such as pistachio canele, almond cake, mini macarons, chocolate tart and macaroon. The cakes did not only look good they tasted fresh and nothing was dry or felt like it has been left out for a long time. All meals and products are paid for myself unless otherwise stated. Reviews and opinions are only based on my personal experience. © Copyright Daisy Wong 2012 all rights reserved http://nevertoosweetforme.com.